It feels like we're standing on the precipice, so buckle up. The burgeoning Yellow Vest Movement in France seems to be morphing into popular resistance. Macron remains AWOL and hasn't made any appearances in the last few days. On top of that, according to the Associated Press, the movement has spread to the Netherlands and Belgium (the European Union's seat of power). Riots are also spontaneously developing in Greece. With Germany's Angela Merkel stepping down, Emmanuel Macron remains the only prominent globalist still standing. Nationalist leaders have risen in North America (Trump), South America (Bolsonaro), Russia, China, India, Italy, Austria, Hungary, and elsewhere. When creatures are backed into a corner they can suddenly do very dangerous things. Surely the leaders of the U.N./E.U./globalist enterprise feel they are backed into a truly precarious corner in which they will not survive if they don't come out swinging. You're absolutely right, President Macron is one of the last, if not the last, globalist left and the system put their chance on him in this attempt to form a new world order with the EU. He's planned to talk tomorrow, finally, because we were wondering if mister president doesn't care for France or if he fled to Rothschilds bunker to write a retirement speech. Nothing he could say will appease the movement anyway and we know how this man just can't do a speech without mocking or despising someone. 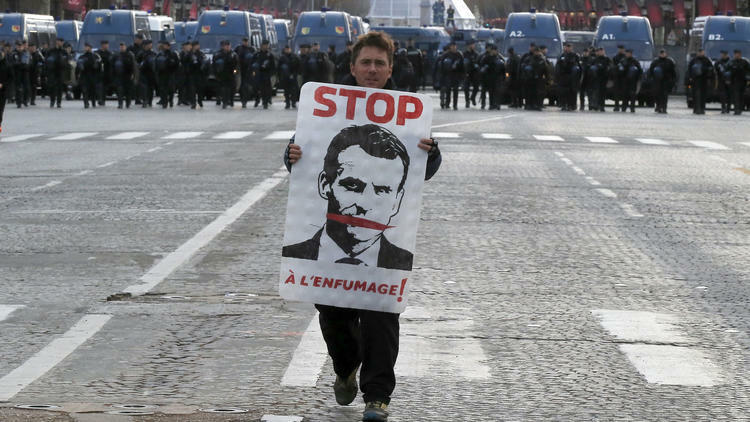 One thing is sure, the real leaders behind the scenes won't let a Frexit happen and they will do everything in their power to keep France in line. Indeed the system is backed into a corner and they are in need of a false flag or repression like we saw yesterday at Paris to maintain 'Emperor' Macron. 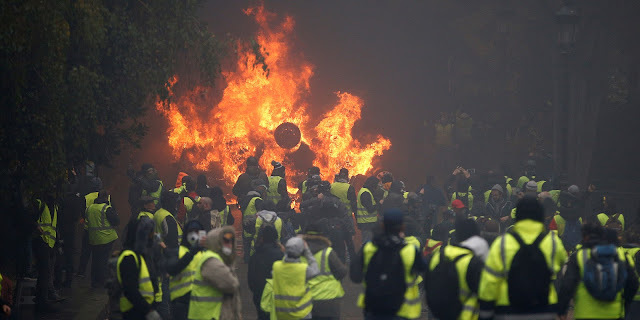 This time, Paris has been literally gased because of cops throwing teargas everywhere and sometimes aggressing peaceful protestors/journalists with flashballs, a 'less lethal weapon' that shouldn't be used against citizens when we see how dangerous it could be. Week after week, the situation in France looks more and more like the book 'Guerilla' wrote by Laurent Obertone. This book present a scenario where Police was hated in France and one day, a cop operating in one of those well known no-go zone killed a young man by accident causing a civil war. The fact that Policemen somehow protect the same system that let them die during terrorists attacks is beyond me. However, I'm happy to see this movement gaining Europe and i'm just hoping it will be better than the infamous 'Arab spring'.